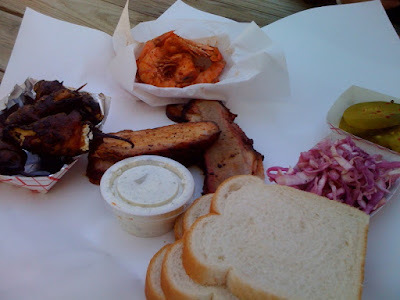 My second trip to Two Bros. was just a month after the first, but I had to get back there to see if the brisket was great twice in a row, and I forgot to try the cold smoked shrimp and stuffed jalapenos back in January. It was a great day, so I headed right for the patio. From there I could see the pits, and I noticed the same pit master wasn’t working. I wondered how this might affect the meat. The brisket was good. Not as good as the first time, but it was still a very good version of smoked beef. Slices were surrounded by a nice smokey crust and a line of well rendered fat. Each slice was well seasoned and smokey, but the texture was a bit tough. All of the flavor was still there, but it just needed more time on the smoker. A cut I didn’t try on the first trip was the sliced pork, and I was glad I got this chance. The pork was tender and full of flavor from the slightly spicy seasoning. The smokiness was there, and the meat was very moist. This was very good pork. The two items I couldn’t resist from the appetizer menu were the cold smoked shrimp and the bacon wrapped stuffed jalapenos. The bacon had crisped well in the smoker, and the spice of the jalapeno was tempered with a cream cheese center. The combination of flavors and texture were incredible. The cold smoked shrimp, while well cooked and nicely seasoned, was missing any real smoke flavor. By all means order it, and you’ll enjoy it, but don’t expect much smokiness. Even after a second visit, this joint still holds up. I’ll be sure to make another visit next time I’m in town. Curious whether the name of this joint has anything to do with the ‘2 Bros’ sign hanging inside Smitty’s main dining room in Lockhart of if it’s pure coincidence?http://lh5.ggpht.com/_zz646ifW2CY/Ss5EiM7CRKI/AAAAAAAAA2U/0eZUPbGvPx4/s640/ACL%20072.jpgAlso, the picture of your food in the post is incredible, potentially the best picture of barbecue I’ve seen. I’m guessing pure coincidence, or at least no connection with the Schmidt family. The owner of two bros bbq is a Texas Tech grad, culinary trained, and has worked in San Fran, Fort Worth, and owns several other restaurants along with his brother. In none of his bio’s that I’ve read connects him to the bbq family. I ate there tonight and my experience was unfortunately not as good as the review. Expecting a tasty feast, I ordered pork ribs, brisket, and sausage. Given the higher than average prices, I was hoping for above average BBQ. What I got instead was a tray of lukewarm brisket, all-around average sausage, and decent pork ribs which were also lukewarm in temperature. The brisket had chunks of unrendered fat, which I ended up cutting away. The sausage was decent, but definitely not exciting. The ribs were the best of the three, with a good crust and a deep smoky flavor. They were, however, a bit dry. In the end, I wound up wishing I had skipped the joint and fired up my own pit instead. Maybe I just had a bad experience, but I was expecting much better, especially for the price. Perhaps I’ll give them another try sometime. Another rare agreement here. Two Bros. is great. Rub is spicy and tantalizing. Each bite begs for another. I thoroughly disagree with the rave review given to two brothers. We went there with high expecations (to match their higher-than-average prices, and were disappointed to say the least. The brisket, while well seasoned, was dry and tough, not warm and moist like you’d expect at a great BBQ joint. The cream corn was cold, and the drinks (grape koolaid and lemonade) were watered down.Honestly, I’ve had better BBQ in a cheap knock-off Los Angeles BBQ Joint. Definitely not what you’d expect from an authentic Texas BBQ joint that was so highly touted.